LEGO is working towards replacing oil-based plastics with sustainably sourced ones and has stated that by 2030 it intends to use sustainable materials in all of its core products and packaging. This year, the first step on that journey has been taken and the first products containing plastics from sustainable sources will soon be on the shelves. To make consumers aware of this, 40320 Plants From Plants, which contains parts produced from sugarcane, will be a gift-with-purchase during August. Will you be able to tell the difference? 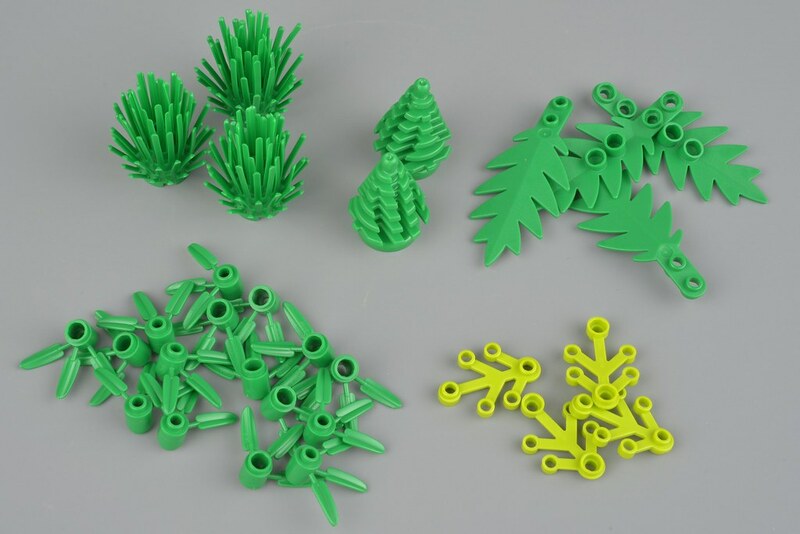 The majority of LEGO parts are produced using ABS and polycarbonate but plants and other flexible pieces are made from polythene, a plastic manufactured from ethylene. That is usually produced from petrochemical sources but can also be made from bioethanol derived from sugarcane or other crops. Producing polythene parts sustainably was therefore the obvious place to start, and making plant pieces from plant ethanol first -- "plants from plants" -- is a masterstroke of marketing. At the recent LEGO Fan Media days in Billund we had an opportunity to talk to Matt Whitby, Environmental Responsibility Engagement and Bistra Andersen, Senior Materials Platform Manager, about this initiative and at the end of the session they gave us a 40320 Plants From Plants to evaluate and review. The small box is so full that it bulges at the seams a bit. The plants from plants logo which adorns the top right corner indicates that the parts inside are produced sustainably but apparently it won't be used routinely on regular sets that contain them. Inside are two bags of botanical elements. No! They look, feel, smell and work just like 'regular' botanical elements. This is because, chemically, they are the same. You can safely mix them with your other plant pieces safe in the knowledge that there is no difference. Note that sustainable does not mean biodegradable: these parts, like everything made from polythene, will not degrade over time. You can never have too many plant pieces so this box provides an excellent opportunity to stock up on them. The fact they are made from sugarcane will make no difference whatsoever in use. However, it does make a difference in cutting down on the use of fossil fuels, so it's a big deal for the company, and the planet. 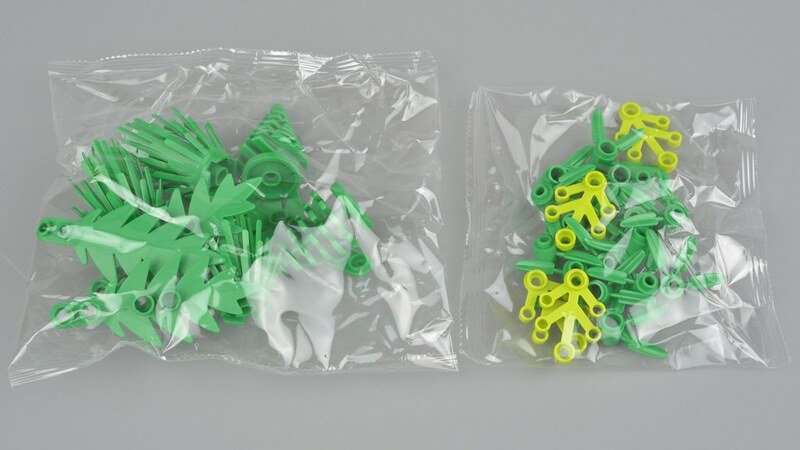 Producing polythene parts in this way is LEGO's first step towards using sustainable materials in all of its core products and packaging and releasing this set is a great way to make people aware of it. 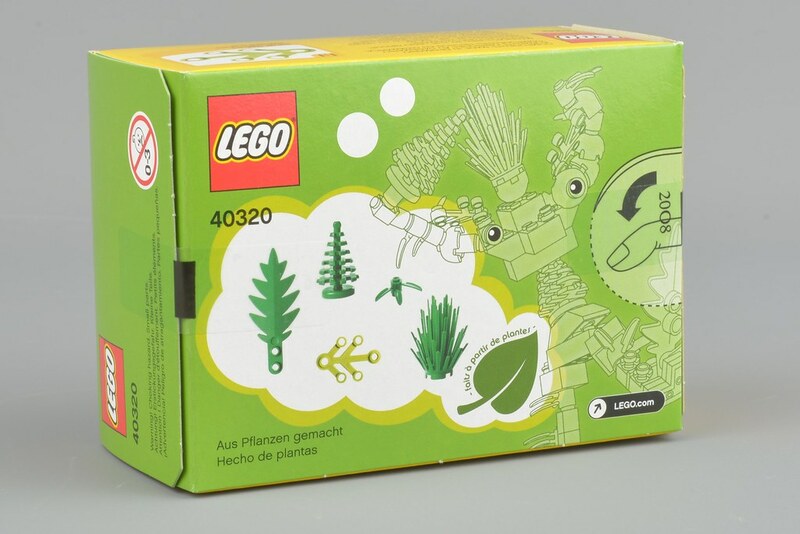 The session at the fan media days was very interesting and if you'd like to find out more about it and the work being done phase out oil-based plastics I recommend you read this excellent article at New Elementary: Sustainable LEGO elements: 40320 Plants from Plants. You'll also find some side-by-side old vs. new comparison pictures there, although you won't seen any differences as there are none. Tom Alphin has also published a great write-up: #40320 ‘Plants from Plants’ is first step towards sustainability. Thanks to LEGO for providing the set for this review, which is an expression of my own opinions. ... did we need the smaller leaves to be in that bright lime radioactive green, though? I will definitely be placing an order to get this. Only hard question is keep it sealed as a cool collectible or open it because I love plant parts? "To make consumers aware of this, 40320 Plants From Plants, which contains parts produced from sugarcane, will be a gift-with-purchase during August." Only in Germany, US, UK and Canada! So "to make consumers aware" they need to promote the set globally instead of just these markets. 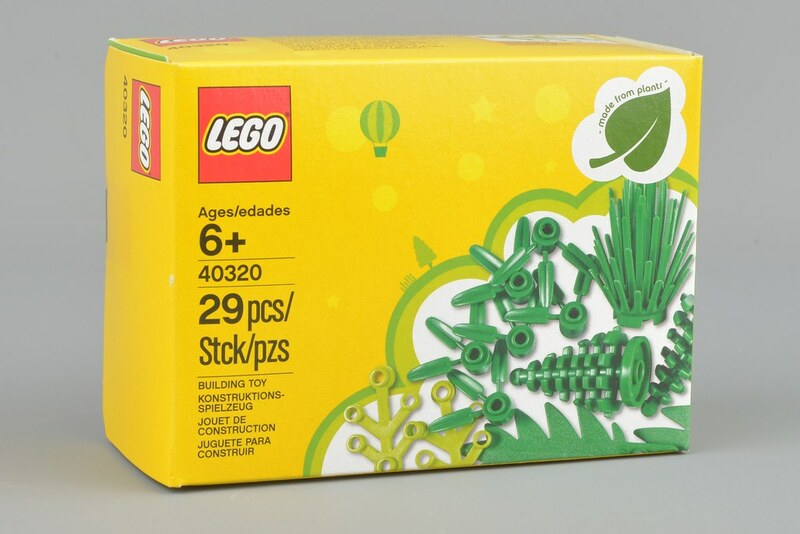 While this set may be marketed as the first to contain plants-from-plants (or should that be parts-from-plants or even PFPs? ), it wouldn't surprise me if LEGO were already selling them unknown to consumers through BAP. I recently bought two of the small spruce trees from BAP and I don't know whether I have the old kind or the new. time will tell if they last as well, but sounds like they should since they are chemically the same. I will bury these underground and see if they start growing sugarcane. Now just make the disposable plastic bags from the same plastic and it's all good! I came here looking for a taste test. Very disappointed. As long as their ecological pieces and parts are as good as ABS ones (durability, compatibility, colors and so) I just can say OK, go ahead this way Lego. No mention of the cost variance, in this article or the other. This leads me to believe it will cost more, at least initially. I wonder how much rainforest was lost in order to grow the cane. It may not be as sustainable as we might hope. There might be a bigger picture to consider. The bigger picture is addressed in the New Elementary article. Exactly. Where is all the sugarcane grown? No help for the environment if the sugarcane producers, in their everlasting effort to cut costs, grow the stuff on burnt-down tropical rainforest or other environmentally valuable areas of land. I wonder if the manufacturing process is also different and if so, whether or not is is more expensive to produce. I hope after the "gift-with-purchase" deal, this set will become available for purchase worldwide, because I want lots and lots of these! I just hope it is a suitable as the other pieces but cool nonetheless. I would have thought that the amount of sugar entering the food chain in many western countries is reducing, so perhaps no additional land is being claimed by the sugarcane producers in order to meet this new demand; it's simply new demand replacing diminishing demand from elsewhere. "TLG are nevertheless facing criticism for using sugarcane, from people who are claiming that they are clearing rainforest in the process. TLG say this is not true, pointing out this would be a minute part of the total global impact and they are working with WWF to source the sugarcane sustainably. Replacing trees is also a much faster process than replacing oil. "But TLG also say there are better prospects than sugarcane such as corn, because these are made from the non-edible parts of the plant. Sugarcane elements are made from an edible source, which could alternatively be used for food." Dang! Should have waited just a few more weeks to buy The LEGO Batman Movie Batwing. Would have been a nice pickup. If this is true, than good for you, Lego! Seriously, this is something to be proud of. Does anyone know why the offer is limited to UK Germany and US? Great to see that Lego are moving to sustainable more sourcing of materials. Let’s hope that they find something that that doesn’t impact in the loss of food production or more of the natural environment like which has been seen with palm oil. Maybe Lego will be the ones who actually find a resource and material which benefits the whole of the world. But, let’s hope the unscrupulous forest clearing persons out there are not encouraged to clear forest for the cash cow of sugar cane until they find that break through. This is absolutely positively great news!!! <3 it! This set is just brilliant! hooray for sustainability! My wife insisted we get plastic cups & eating utensils for our wedding reception made of plants, 100% biodegradable. We tested by throwing a fork in the garden & it shriveled into nothing within a couple weeks. More expensive, but pretty neat nonetheless. Trouble is a leftover stack of cups that we put in the camper became warped & unusable after a few years. So the "will not degrade over time" part was what caught my eye & hopefully time will agree. The IUPAC notes that "A biobased polymer similar to a petro based one does not imply any superiority with respect to the environment unless the comparison of respective life cycle assessments is favourable". As that assessment is not possible yet no positive environmental impact can be asserted as proven fact. What we do know is that this sustainable plastic is only given away to those people who spend money on far more unsustainable plastic & that neither product is likely to biodegrade any time soon. If the land wasn't used for bioplastics it could indeed be used for food or forest (or even car-parks) but to sustain it long term it is likely to require agri-chemical investment - pesticides, fertilisers & the like, as well as greater economies of scale (eg mechanisation and agri-business) & GM to improve yields & fight pests. There is no way Lego can secure their primary raw materials without industrial scale activity & the sugar cane industry already has a terrible cost in human lives (eg 20000 in last 20 years due to CKD) & a poor environmental record. This is not going to be a mom & pop scale enterprise. This might well be a good environmental move eventually but for now this is just a token gesture & marketing hogwash. Shame that this is just a promotional set. Packs like this should be always available. I know I would buy multiples. That said, I hope lego will put some effort into fixing the ridiculous cracking problems with their regular bricks. It is the main reason that has pushed me to buy more non-lego building blocks: they don't disintegrate like lego does. Now if they had remade the extremely rare cypress tree in this set, this might have been a noteworthy set. I count 16 palm leaves instead of 4. Am I the only one interested in the plant monster suggested at the back of the box?? That is cool! I live across the street from a sugarcane farm... well lots of sugarcane. This includes info about the new plant-based plastics, as well as their ambitions to replace other plastics like ABS with renewable materials. As an environmental engineer, my favorite toy company doing this makes very happy. Hopefully they will find a way to subtitute the plastic bags too. I'm always rather worried when Lego announces major production changes, as they (despite all the reassurances in the New Elementary article) seems to have a hard time admitting to any issues or that a significant fraction of the users are dissatisfied with the change. Most of us remember the grey/bley fiasco in the early 2000s and the switch to the "in-mold" coloring process around 2007 (which lead to particularly white, yellow and red bricks having a nasty "I can't believe it's not clone bricks" translucency). Luckily I haven't noticed the cracking Stupibea mentions, but if people really buys clone bricks for their superior quality, then Lego has a serious problem. They may have gotten away with it this time, probably due to a combination of chemical similarity between the plant-based and fossil ethylene, and how the plant elements IMO feels pretty awful to begin with. I'd be far more worried if/when they starts screwing with the ABS and PC elements, as the look, fit and feel of these are fare more crucial. And as many others has mentioned, there's the issue if the production of sugarcane competes with food production or leads to deforestation. It's a bit like the controversy about the bio-diesel they try to phase in many places - many experts says it probably leads to more environmental damage than just using fossil diesel. The New Elementary article also mentions problems with so-called "bio-degradable" plastic, many types don't actually degrade fully but rather disintegrates into the nasty micro-plastic everyone talks about nowadays - if this is true it wouldn't qualify as bio-degradable in my book. Edit: The Brickarchitect article mentions cutting down on paper - I guess they could save quite a bit by having less "dumbed down" instructions, I really miss the old ones where they added as many parts as possible in each step. Also the boxes are still often way too big (especially for small sets), the Go ***ck Me box is about 3 times as big as necessary, while the Statue of Liberty one felt pretty well-filled. At least it seems like they've realized bio-degradable plastic is a bad choice for lego. I'd still pick this up given the chance though. When are they going to make cypress trees again? Just to be clear, these are regular green and not bright green, right? A little hard to tell due to the lighting, but AFAIK none of these parts have ever been made in bright green. Cool! So, what exactly do you have to do in order to get one of these sets?